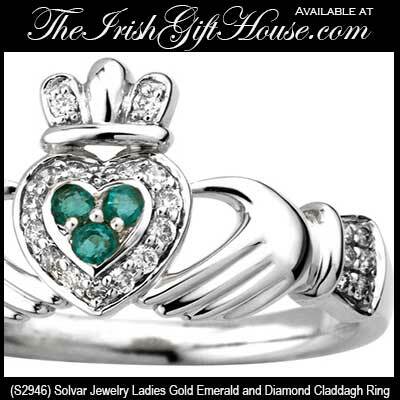 Emerald Claddagh rings transcends of the beauty of Ireland. 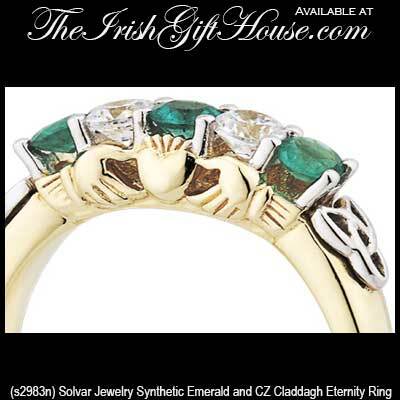 This assortment of Claddagh rings includes those with emerald hearts along with several that features the green stones as accenting. Many of these emerald Claddagh rings would make excellent Claddagh engagement rings while others are eternity or dress rings. Choose from various precious metals that include gold and white gold along with an assortment in sterling silver. 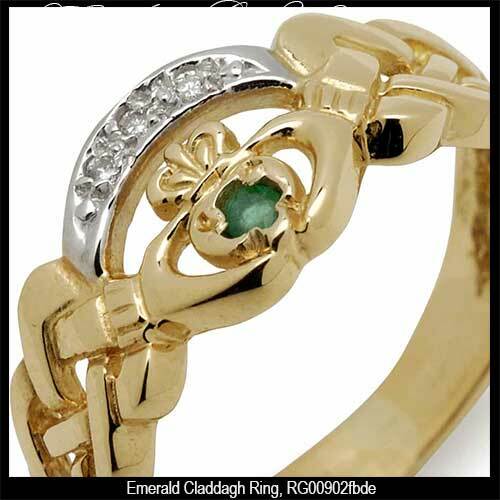 The majority of these Claddagh rings feature genuine emeralds but several offer lab created stones. The respective product descriptions will provide all the details. 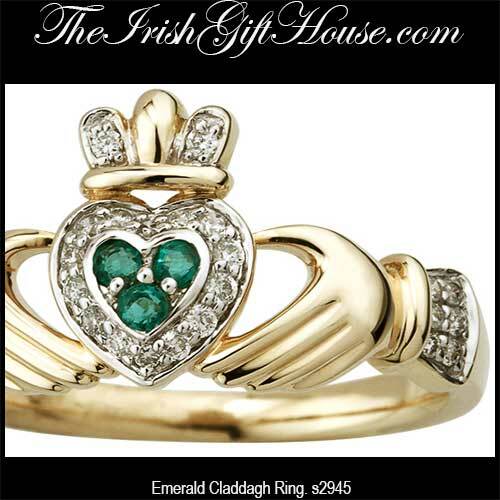 The Irish Gift House is proud to feature Claddagh rings with emeralds that are made in Ireland. 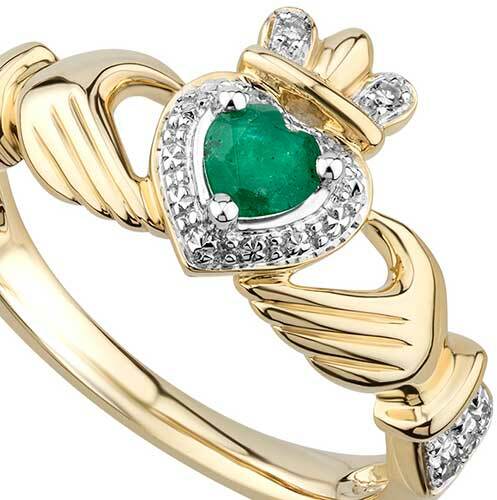 Gold Claddagh ring features a genuine emerald heart along with two rows of channel set diamonds. 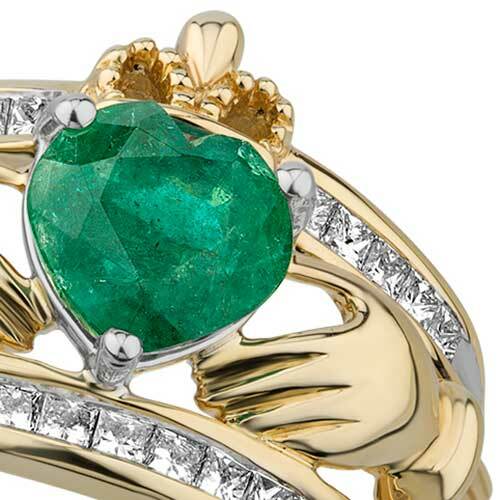 Emerald Claddagh ring is crafted in 14K gold and it is enhanced with diamonds. 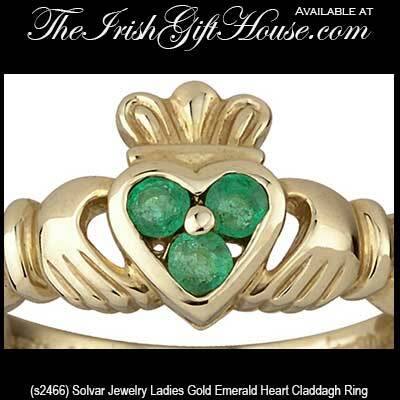 Gold Claddagh ring features a lab created emerald as the heart. Gold Claddagh ring features a lab created emerald heart and is enhanced with a white gold crown. 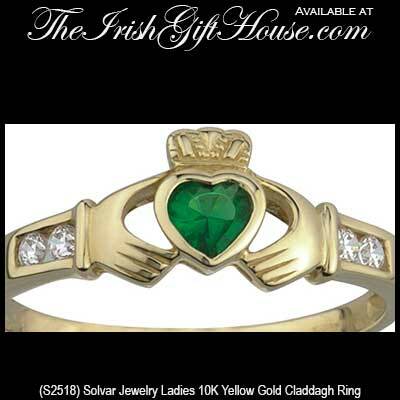 Gold Claddagh ring features an emerald in the heart. 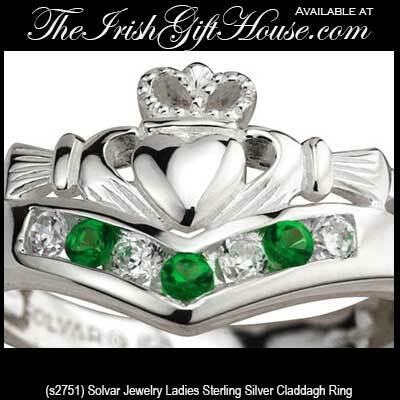 Sterling silver Claddagh ring for women features an emerald heart. 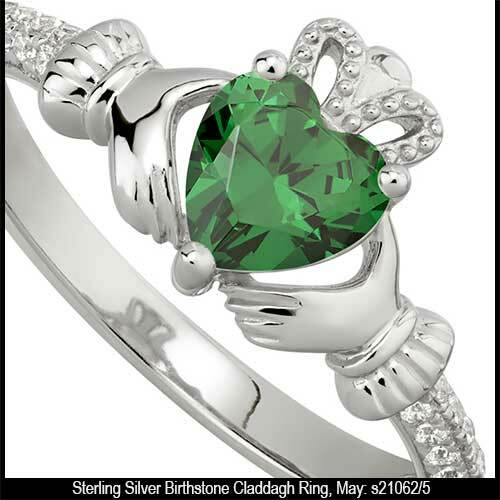 Emerald Claddagh ring features sterling silver construction; its birthstone heart represents the month of May. 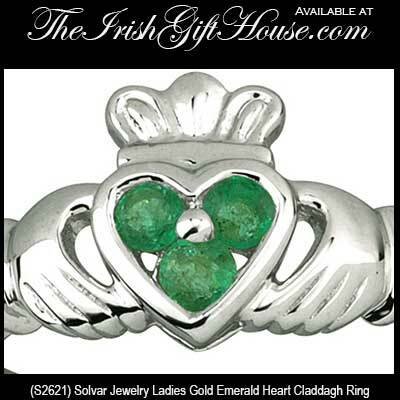 Small Claddagh ring is crafted in sterling silver and it is enhanced with an emerald heart. 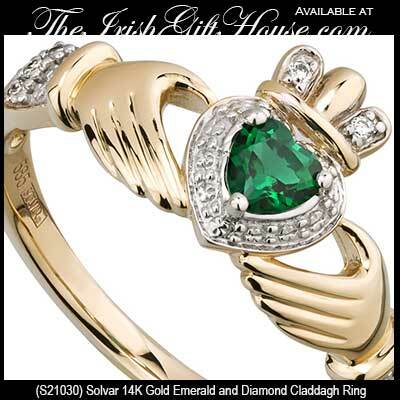 Please take a look at our Claddagh wedding rings for more examples of this iconic Irish design with emeralds. 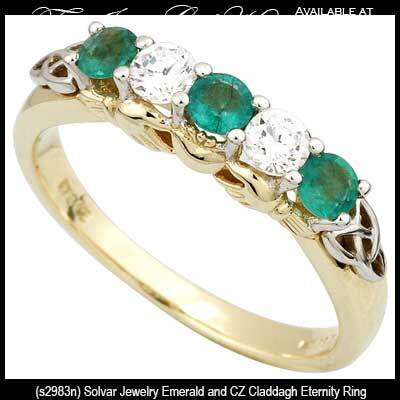 The Irish Gift House also has additional Irish jewelry with the green stones; our most popular assortment is the Connemara marble jewelry. 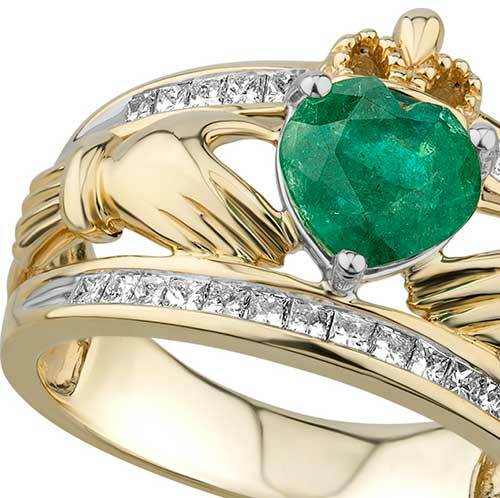 You may wish to take a look at our Connemara marble rings; this selection includes Claddagh rings that have a heart that is accented with Ireland's gem stone. 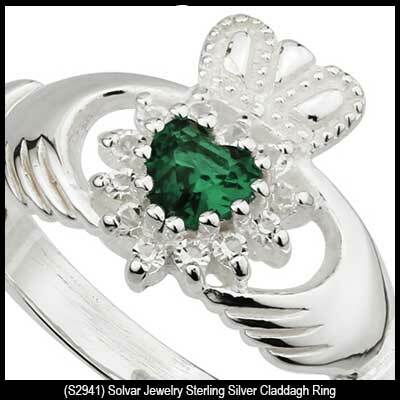 Our sterling silver Claddagh rings section is by far our most eclectic range; in addition to a few designs with May's birthstone we have several green crystal accented pieces along with several that combine Celtic knots into the design. 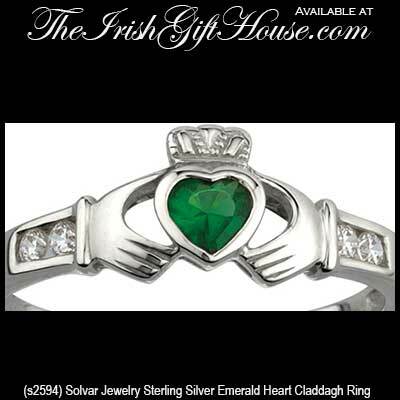 The Irish Gift House also has an assortment of men's Claddagh rings where we have some masculine designs that are enhanced with emeralds. This assortment of emerald Claddagh rings are made in Ireland by Solvar Jewelry or O'Connor along with TJH Jewelry.